I got back into town early and decided to bake. But I didn’t want to scoop cookies or frost cupcakes so I decided upon a nice and easy bar cookie. I simply Googled “oatmeal bars” and came up with this one. These are okay. Nothing special and a little boring. I probably won’t be making them again. Cream 1 cup butter and sugars until light and fluffy. Beat in egg yolks. Add flour and rolled oats and mix well. Spread in a greased and floured 13x9x2-inch baking pan. Bake at 350° for 20 minutes. 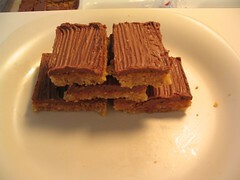 Melt chocolate bars or morsels with the 2 tablespoons of butter. Spread over cooled cookie layer; sprinkle with chopped nuts. Cut into 1 1/2-inch squares. Notes: I omitted the nuts. Also, I used my hands to spread the batter into the baking pan–it was really thin. I like bars, but I have to really be in the mood for them. I think they tend to be rich, and like you said, boring except for the one star ingredient. Abby, I think that’s the problem with these–there is no one star ingredient. They are just totally BLAH. Actually, yeah. Mainly because I’ve been buying stuff in bulk at Cost Plus, so it’s cheaper and I always have it on hand for when people hire me to make things for them. The one thing I never have on hand however, are eggs. i see a picture of some delicious looking sugar cookies on your blog, however i don’t see the recipe. how much might you charge to bake a batch and send them halfway across the country? I’m actually making those tonight, freezing them, then frosting them on Sunday. I’ll post the recipe next week. The recipe makes about 5 dozen…how many were you interested in? These were pretty good. I’m into these bake at home energy / cookie mix that I get offline. I’ve made the chocolate chip version and put chocolate icing on it and man it was sooo good. http://www.matisseandjacks.com is the site. I order from them all the time. All you need is applesauce and yogurt so you don’t need a lot of baking stuff. hi excuse my english 🙂 i need to know if the glaze for your sugar cookies will harden up, i need to make a cookie bouquet and i need a glaze that will harden up, i like your glaze it is so different.